GAF is an acronym for General Aniline & Film, the new name of Ansco after 1967. It was not a major manufacturer as such, but a brand name used in the US and UK for cameras (including cine cameras) built by other companies according to their own specifications. GAF sold several 35mm SLRs, rangefinders and viewfinder cameras. The SLRs and rangefinders were made by Chinon, and were functionally the same as Chinon models. 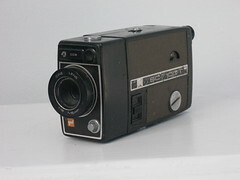 Other formats may have been made by Haking, which bought the company (and the Ansco brand) in 1978. GAF L-17 (has double exposure capability). GAF L-CM (has double exposure capability). GAF Memo 35 ET (similar to 35 EE, but with the slower f/2.8 lens, making it comparable to the Vivitar 35EE and Chinon 35EE). by Matt Jones (Image rights). GAF Anscomatic 726 (a rebadged Petri rangefinder). GAF 136 XF (126, cartridge camera, clone of Halina Signal Flash).